The recession is a perfect time to launch a new business or new product, especially what I call Category Killer Innovation, or what Clayton Christenson calls a "Disruptive Technology." The Category Killer Opportunity window is not a single opportunity space or event but a cluster of smaller fortuitous opportunities that bundle together (such as the design enhancement opportunity, a production challenge opportunity, the value chain opportunity, the supply chain challenge opportunity window and many others) to form a "super opportunity space" or in this case a Category Killer Innovation Opportunity Window. If history is any indication, we will see a flood of distruptive technology hitting the market between now and 2014. "Starbury, Inc. is an American brand of sneakers and clothing endorsed by NBA players Stephon Marbury and Ben Wallace, and marketed by Steve and Barry's. The line was launched in September 2006, as a pair of $14.99 basketball shoes to compete with higher priced products endorsed by celebrity athletes. Stephon Marbury and retail clothing chain Steve & Barry's claim that the products are of the same level of quality as more expensive alternatives." Now India is about to unveil tomorrow a prototype of a $10 laptop (which actually costs $20 to produce.) It will be subsidized by the Indian Education Ministry, so that eventually every school child in India will be able to afford a laptop and access to the Internet. This is a counter-offer to the MIT Negroponte project which was proposing a $100 laptop per child for India, but the Indian government thought that they could do one better. The $10 laptop will come with WiFi, 2GB of memory, Ethernet and expandable memory capability and consumer just 2 watts of power. There are still many unanswered questions, such as can they find the supply chain to manufacture the laptop at that low cost and many others. How will they protect themselves from reverse engineering and IP theft and the grey market? I started to review and update the process of designing a business model for a new startup from the material I teach in my Innovation and Entrepreneurship classes-specifically the Opportunity Clinic. In this article, Fortune identifies 10 strategic issues or tactics to manage your business in a recession. I’ve added 18 more strategic questions of my own from the Opportunity Clinic, to get a total of 28 tactics or strategic issues that each business or entrepreneur should be seriously considering and re-evaluating now, if they have yet to do so. In turn, these general components can be further subdivided into 28 strategic issues or questions, that every entrepreneur should be asking himself or herself when first designing a business model for their business idea or concept. In recessionary times however, tactics that made sense in fast growth times can be absolutely disastrous, even survival-threatening for many businesses. If you haven’t done so, business needs to step back and explore each one of the assumptions behind their original business model idea. Criteria for assessing the overall business model in recessionary times could include profit potential, robustness (ability to withstand changes in assumptions about underlying internal or external conditions), adaptability, resilience, and sustainability. The December 2008 figures for unemployment in Canada, USA, Europe and Asia were generally grim sounding and greeted with doom and gloom by the media and most politicians-the worst or steepest drop since the 1930's in some cases. Stating the obvious, Fortune says: "
"Managing in any recession is difficult; managing through this one is especially hard because it's different from previous ones in multiple ways. Most immediately significant, employment is plunging more steeply than in a long time--by more than two million jobs [in the US} last year, more than during the previous two recessions, and this one is far from over." However, entrepreneurs should look at the plus side and see this as an opportunity to capture new talent that is normally difficult to recruit in good times and fill key positions with experienced staff that may now be out on the street looking for jobs. A good friend of mine, who was formerly a Country Sales Manager with a top 5 consulting firm, is now looking for a job. Anyone need to fill a Sales position with an excellent candidate? "Reevaluate people--and steal some good ones. Just as most investment managers look like geniuses in a bull market, most employees can look like excellent performers in a booming economy. Now is when you identify the impostors. Working hard at that task is important, because if you need to lay people off, as you well may, it's critical that you choose wisely. A subtler danger: If salaries or bonuses need to get whacked, you may be tempted to reduce them equally across the board in an effort to show that we're all in this together. But think of the message that practice sends to your best performers, who will feel they're being punished rather than rewarded for their great work. Mel Stark of the Hay Group consulting firm points out that in his survey of the World's Most Admired Companies as ranked by Fortune, the best ones take extra pains to reassure their "most driven and focused employees," the ones it is most important to keep. Instead of spreading the pain, reward your best workers well, even in a recession. Then scout for competitors that are sharing the misery equally and steal their best performers." In summary, protect your own best performers from competitive poaching, and do some aggressive hiring and poaching yourself, while times are bad. Cognitive Skill?What's negative, positive, different and interesting about unemployment in this recession? "While the odd phenomenon of "tree-power", or a sustained voltage difference between many plants and their surrounding soil has long been observed, the scientific basis for this effect has been the subject of debate. In a recently published paper on the subject, researchers from MIT's Center for Biomedical Engineering believe they have found the answer, postulating that the effect is mainly due to a difference in pH between parts of trees and the surrounding soil and ruling out other theories such as an electrochemical redox reaction (think 'potato batteries'). The practical application of this power source envisioned by researchers is to provide enough trickle-charge to self-sustaining temperature and humidity sensors in remote locations where replacement of batteries is costly and impractical. The energy produced would slowly charge an off-the-shelf battery within the sensors enable wireless transmission of signals four times a day. These signals would jump from one sensor to the next until they reached an existing weather station linked by satellite to a forestry command center and would transmit data immediately in the event of a forest fire. Voltree Power is in the final stages of prototyping such a system with trials set for the spring on a 10-acre plot of land provided by the US Forest Service. The company also sees applications beyond fire monitoring for its “bioenergy converter”, including remote environmental and agricultural sensing, climate science research and even Homeland Security and border protection, where trees could be fitted with sensors to detect potential threats like smuggled radioactive materials." One year ago in my presentaion at the World Futures Society on Smart Technologies I was reflecting on how smart technologies, namely nanotech and biotech converging technologies could be used to address the Millennium Development Goals (MDGs). In April 2007, the General Assembly of the Economic and Social Council (ECOSOC) of the United Nations convened to discuss progress made towards the Millennium Development Goals (MDGs). Professor Patrick Webb, dean for academic affairs at the Friedman School of Nutrition Science and Policy at Tufts University, presented on the status of the Millennium Development Goal One (MDG1): radically reducing extreme poverty and hunger. The MDGs were developed at the United Nations Millennium Summit in 2000 to set measurable goals and targets for a range of pressing global problems, including poverty, hunger, disease, illiteracy, environmental degradation and discrimination against women. MDG1 has a twofold objective: reduce the proportion of people living on less than a dollar a day, and reduce the proportion of people suffering hunger by half. In order to meet these goals, Webb highlighted recent successes that can guide future efforts. integrating mainstream lessons from successful action in humanitarian settings (saving lives and reducing acute malnutrition) into development interventions. Development efforts can address these issues by improving protocols and products for treating malnutrition, and preventing malnutrition by enhancing behaviors and choices that lead to improved nutrition throughout the lifecycle. To address the multidimensional nature of these problems, the first MDG addresses five distinct goals: reducing poverty, narrowing the poverty gap (between richest and poorest), increasing the share of income enjoyed by the poorest families, reducing the share of preschool children who are underweight, and lowering the share of each country’s population that has too little to eat. Speaking on behalf of the three Rome-based agencies of the United Nations (the Food and Agriculture Organization (FAO), the World Food Programme (WFP), and the International Fund for Agricultural Development (IFAD)), Webb argued that governments should engage more seriously in measuring their own progress towards agreed goals. Solutions to hunger are known, and novel approaches to the treatment and prevention of malnutrition in emergencies have shown that quick gains are possible. Making such gains sustainable means scaling up innovations across developing country settings, and targeting resources towards such key priorities. This meeting of Member States, UN System Organizations, other major institutional stakeholders, as well as non-governmental organizations, academics and foundations concentrated on the theme “Eradicating poverty and hunger – Joining forces to make it happen.” The conference explored the issues and set the groundwork for the ECOSOC’s first Annual Ministerial Review (AMR) this summer in Switzerland. Webb will continue to work with the many stakeholders involved in assessing progress and further advancing the important human goals that are the MDGs. Expert, Consultant and Keynote Speaker on Emerging Smart Technologies, Innovation, Entrepreneurship, Strategic Foresight, Business Development, Lateral Creative Thinking and author of an upcoming book on the Smart Economy "
"Google has expanded its mission to lay bare the world’s information by investing in a company set up by its co-founder’s wife that lets users trawl their genetic profile online. The move comes as Google, keen to present itself as a benign Big Brother, radically extends its efforts to build precise profiles of online consumers to target advertising campaigns more precisely. " It emerged yesterday that Google has invested $3.9 million (£1.9 million) in 23andMe, the biotech company co-founded last year by Anne Wojcicki, a former health sector analyst who recently married Sergey Brin, the search giant’s billionaire co-founder. By encouraging individuals to learn about their own genetic information, 23andMe aims to create an “open resource” that can help to accelerate drug discovery and bring about a revolution in personalised medicine. " Should we now be looking at adding DNA ID theft to the list of other ID theft frauds? Will dating agencies now help us find our true love based on 'suitable' gene pool? Will BANS (body area networks) and BIo IT specialists be the nex hot field? "Nanotechnology has the potential to generate enormous health benefits for the more than five billion people living in the developing world," according to Dr. Peter A. Singer, senior scientist at the McLaughlin-Rotman Centre for Global Health and Professor of Medicine at University of Toronto. "Nanotechnology might provide less-industrialized countries with powerful new tools for diagnosing and treating disease, and might increase the availability of clean water." "But it remains to be seen whether novel applications of nanotechnology will deliver on their promise. A fundamental problem is that people are not engaged and are not talking to each other. Business has little incentive as shown by the lack of new drugs for malaria, dengue fever and other diseases that disproportionately affect people in developing countries to invest in the appropriate nanotechnology research targeted at the developing world. Government foreign assistance agencies do not often focus, or focus adequately, on science and technology. With scant public awareness of nanotechnology in any country, there are few efforts by nongovernmental organizations (NGOs) and community groups to examine how nanotechnology could be directed toward, for example, improving public health in the developing world." Nanotechnology applications related to energy storage, production, and conversion; agricultural productivity enhancement; water treatment and remediation; and diagnosis and treatment of diseases topped the list. Dr. Singer's group has also shown that there is a surprising amount of nanotechnology R&D activity in several developing countries, and that these nations are directing their nanotechnology innovation systems to address their more pressing needs. "Countries like Brazil, India, China and South Africa have significant nanotechnology research initiatives that could be directed toward the particular needs of the poor. But there is still a danger if market forces are the only dynamic that small minorities of people in wealthy nations will benefit from nanotechnology breakthroughs in the health sector, while large majorities, mainly in the developing world, will not," noted Dr. Andrew Maynard, chief science advisor for the Woodrow Wilson Center's Project on Emerging Nanotechnologies. "Responsible development of nanotechnology must include benefits for people in both rich and poor nations and at relatively low cost. This also requires that careful attention be paid to possible risks nanotechnology poses for human health and the environment." Dr. Piotr Grodzinski, director of the Nanotechnology Alliance for Cancer at the National Cancer Institute, National Institutes of Health (NIH) discussed the impact of nanotechnology on diagnostics and therapies for cancer. He said, "It is my belief that nanomaterials and nanomedical devices will play increasingly critical and beneficial roles in improving the way we diagnose, treat, and ultimately prevent cancer and other diseases. But we face challenges; the complexity of clinical implementation and the treatment cost may cause gradual, rather than immediate, distribution of these novel yet effective approaches." "For example, in the future, it may be possible for citizens in Bangladesh to place contaminated water in inexpensive transparent bottles that will disinfect the water when placed in direct sunlight, or for doctors in Mexico to give patients inhalable vaccines that do not need refrigeration," Dr. Maynard noted. "Nanotechnologies could revolutionize health care in developing countries and make treatments more readily available for diseases that claim millions of lives around the world each year." The discussion took place at a program entitled "Using Nanotechnology to Improve Health Care in Developing Countries," held at the Woodrow Wilson International Center for Scholars. The event was organized by the Wilson Center?s Project on Emerging Nanotechnologies and Global Health Initiative. It was moderated by Dr. Jeff Spieler, chief of research, technology and utilization for the Office of Population and Reproductive Health at the U.S. Agency for International Development (USAID). international experts on addressing possible nanotechnology risks and developing safe nanotechnologies, and brings a much-needed science perspective to a field fraught with uncertainty. The next time you are in New York City, drop into the Marriott Marquis hotel in Times Square and take a ride up the elevators in the newly renovated lobby. Before you get on, you'll notice something different. Instead of a single button to summon the elevator, there's a keypad. You key in the number of the floor you want, and the computer directs you to a particular elevator. At that elevator you'll will find a group of people headed to your floor and those close to it. When your smart elevator arrives it whisks you express to your floor and next adjacent floors, instead of taking the "traditional milk-run elevator" having to stop at every floor along the way. Elevator rides will change based on traffic. Building managers like it because it saves energy too, because of the overall shorter rides and fewer stops and starts. 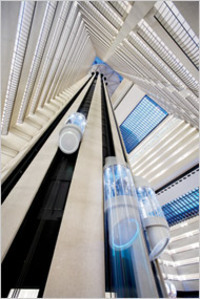 This new generation of “smart elevators” called Miconic 10 is made by Schindler Elevator Corporation. All new high-rise buildings in Manhattan will soon have them. The system is based on a simple fact: when an elevator contains a group of people going to many different floors, each person’s ride becomes longer than if traveling alone. By sorting people into groups headed to nearby floors, each person’s journey becomes — on average — 50 percent faster. This concept or the Opportunity Window here could be called "Customer Clustering". Most people reading this story will stop here-likely thinking -what a neat and simple idea. or ...."Why didn't I think of that?" Seasoned or serial entrepreneurs will take it a step further, thinking....how can I transfer this concept of customer clustering into my business environment? Banks started doing this a decade ago by creating single line-ups (cues) that would direct customers to the next free available teller. Previous to this I would always invariably end up in the line where the patron in front of me would have a half hour of banking to do. Government agencies quickly followed suite. Where else could "customer clustering" be applied? In my humble opinion airlines have always done a terrible job of boarding passengers. Boarding from back to front makes intuitive sense but there is a much more efficient way of doing it, using customer clustering as the opportunity window concept. What happens now? Invariably the aisle seat passenger gets settled into his/her seat before the window passenger makes it to their place. They then have to unbuckle, stand up to let the late passenger into the middle or window seat, all the while, road blocking all the incoming traffic in the aisle. I've always said that it makes much more sense to board all window seat passengers from the back to the front first, followed by middle seat passengers, followed by all remaining aisle seat passengers, back to front. Intrigued and interested in learning and applying this type of thinking in your business or organization? We have over 200 such examples of such generic opportunity windows in our Opportunity Clinic Workshops. Call or write for details.